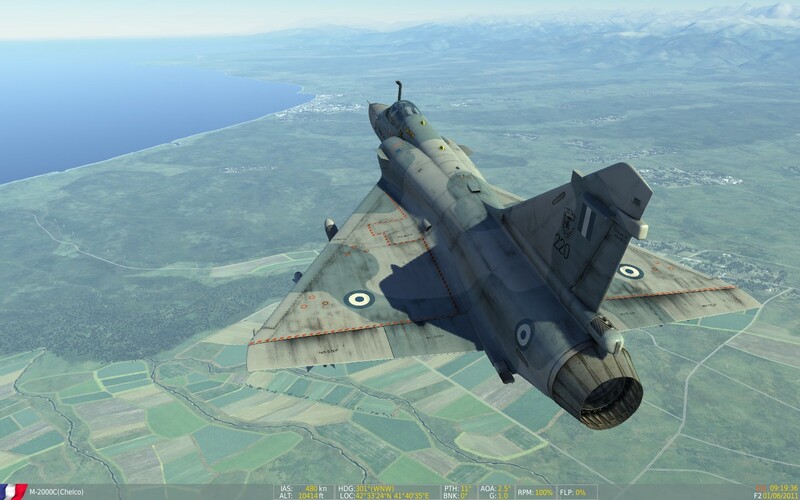 Real and Simulated Wars: Mirage M-2000Cs for DCS World - This Will Come in Handy! Mirage M-2000Cs for DCS World - This Will Come in Handy! RAZBAM's initial roll into the runway of the DCS virtual World was not as bad as other third party's, but not as great as Belsimtek's (Tiger II, Mig 15 bis, F-86 Sabre, MI-8, UH-1H Huey). Take off towards a BVRish engagement against a Mig 21bis. Problems with the radar loosing lock and the modelling of the 530 radar-guided missiles and others plagued the initial beta release of the M-2000C. 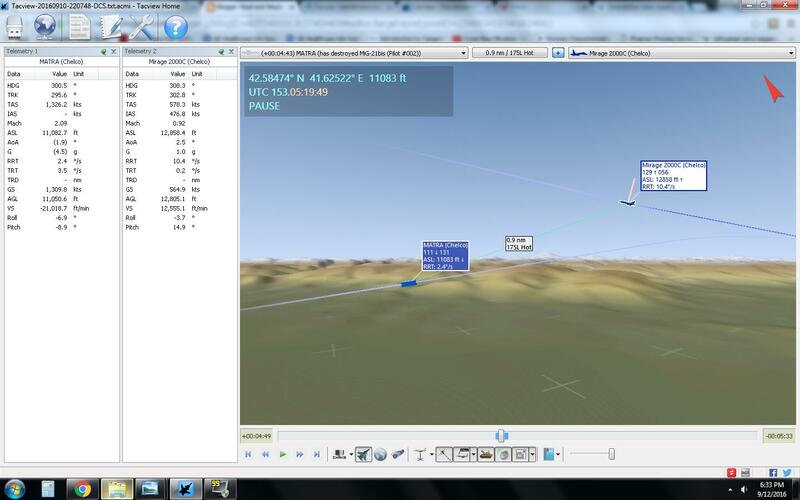 But the virtual bird was and continues to be exhilarating to fly. Its ability to climb is just out of this planet (pun not intended). It was a pity, because the radar is supposed to keep lock on targets below the aircraft, and in real life the 530Ds can be shot at those targets ... Imagine that: outclimb bandits, and drop missiles on them from above! In this BVR (sorta, the range was kind of not so big) engagement I detected a bandit (with lots of help. Thanks, AWACS!) with the radar: is the "V" Chevron with a 27 on it. I later locked it. Once locked, I started a climb. Not very aggressive, but I ended up some 4,200 ft above the Mig-21 at the time of firing the 530 missile. 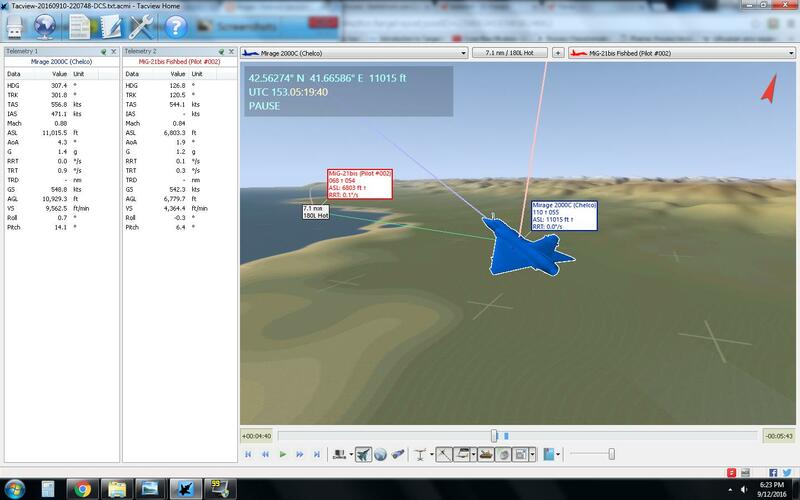 Tacview of the engagement, right before I launched the first missile. 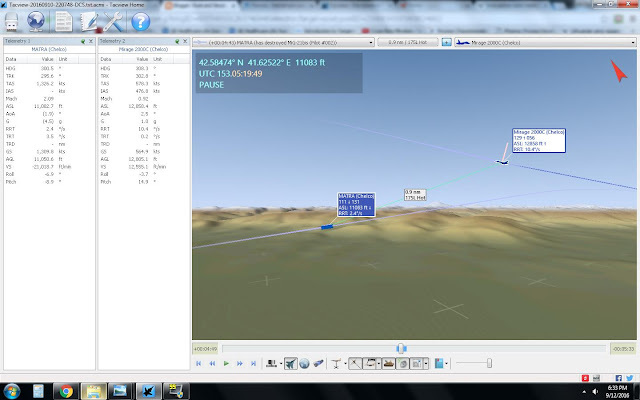 Note the altitude difference between my Mirage and the Mig. Fox 1! 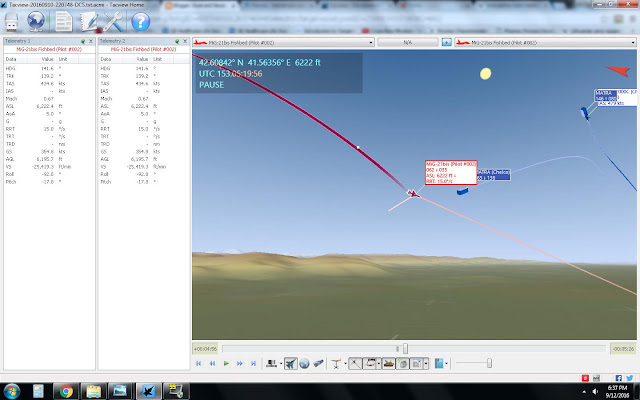 The 530 missile (contrail) just fired from my Mirage arches down in search of the target. The missile's and my aircraft's flight paths. From Tacview. The 530 missile performed flawlessly. It maneuvered boldly to get into a lead intercept of the MIG. In the background, my M-2000C is launching another missile. 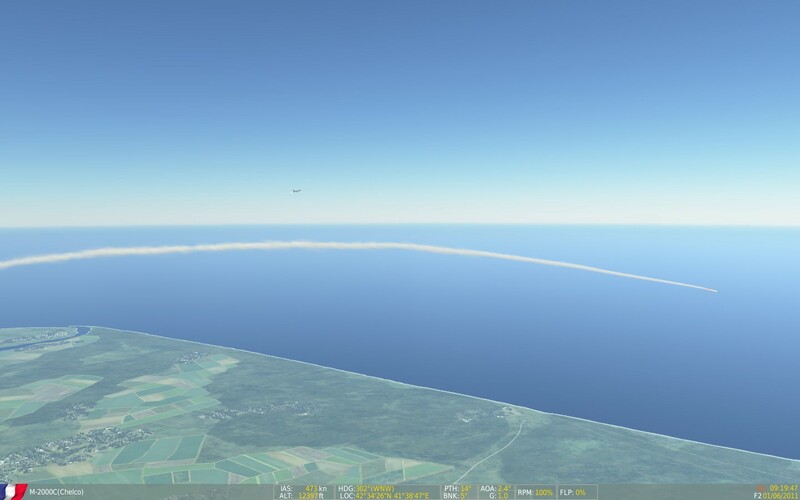 The second missile went ballistic, off course, because I lost radar lock of the remainder chunks of the MIG-21. It was a good show. I plan to use this "shoot down" thing a lot. 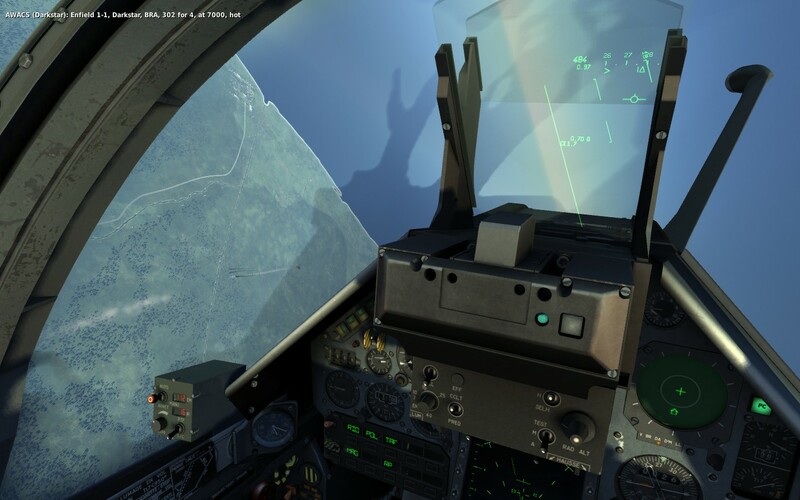 Although the angle between my nose and the target was in the low 20s (not too impressive for modern air combat lock-ons), the MIG-21 didn't get a chance to even paint me with his radar. 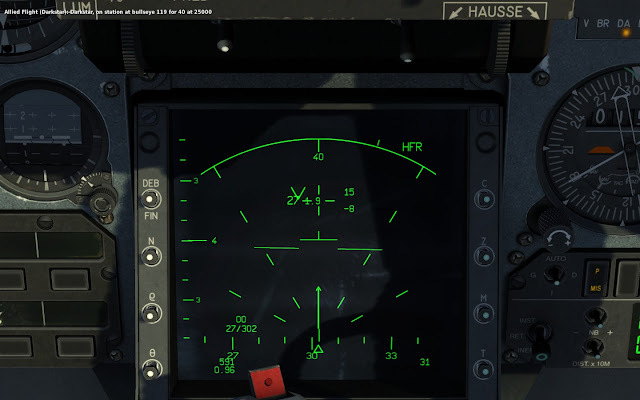 What I can't get is to search and find targets below my aircraft. I suppose it's because of the ground clutter. On the meantime ... AWACS! So perhaps the type's BVR deficiencies as modelled in DCS are realistic and intended? Hi Dimitris, it's always a pleasure to see you around here. Thanks for your comment. I don't know, but if the current radar in the virtual M-2000C is modelled to the standards you are writing about, that would blow my mind. 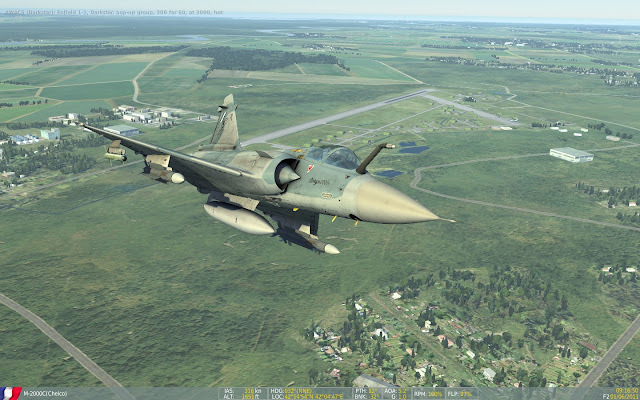 The Razbam Mirage 2000C DCS module should represent the newer variant with the RDI radar. Thanks! This clears it up. ROBLOX is powered by an ever growing membership base of more than 300,000 creator players who produce an infinite variety of highly immersive experiences. These experiences range from 3D games and competitions, to interactive adventures where friends can take on new personas imagining what it feels to be a dinosaur, a miner working a mine or an astronaut on a space exploration.